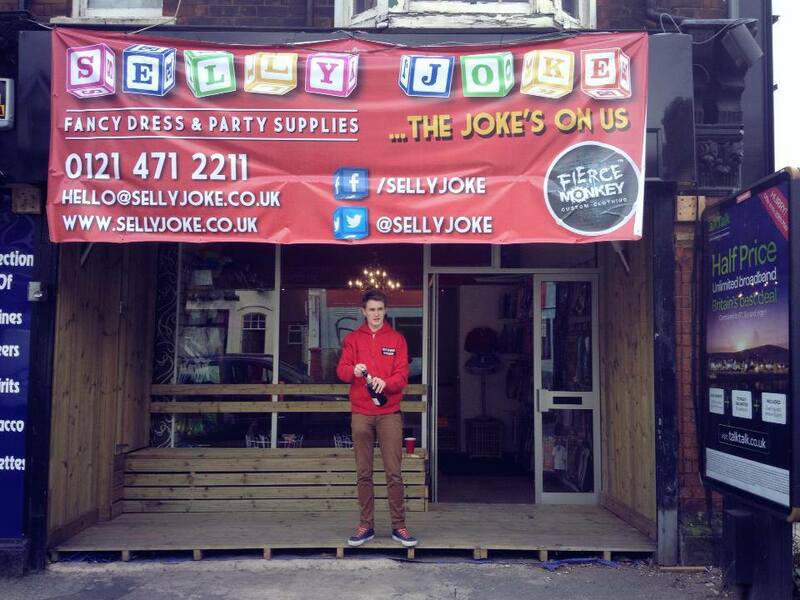 Selly Joke are delighted to announce they are now open for business at 514 Bristol Road in Selly Oak, next door to the Drinks 2 Go man. Providing fancy dress and party supplies to the students of Selly Oak and the wider community, the business was founded by Matt Rolfe (BA Ancient History & Archaeology 2012) and Chris Bates (BA History 2012). They met at the University of Birmingham whilst volunteering with Carnival RAG, and after graduating decided that working 9-5 in an office wasn’t for them. With the help of the team at BSEEN, as well as a loan from the government’s start-up loan scheme, they were able to register as a limited company, source a shop premises and stock, and are now open Monday – Saturday from Midday till late providing a range of costumes, accessories and party supplies. Through the BSEEN program they learned all about business formation, accounting, digital marketing, goal setting and networked with a number of other student entrepreneurs who have helped them on their journey. Additionally the BSEEN program has arranged mentoring with a number of local entrepreneurs such as Purple Frog Property and MyOnesie, which has been invaluable. Looking forward, Selly Joke will be launching an eBay store in the next few weeks, and will be travelling the country attending a number of music festivals over the summer, starting with the student run Vale Festival at the University of Birmingham on 1st June.